I’m in a bit of a quandary about how to do this. I have videos and I have photos and I have a fair amount of both. 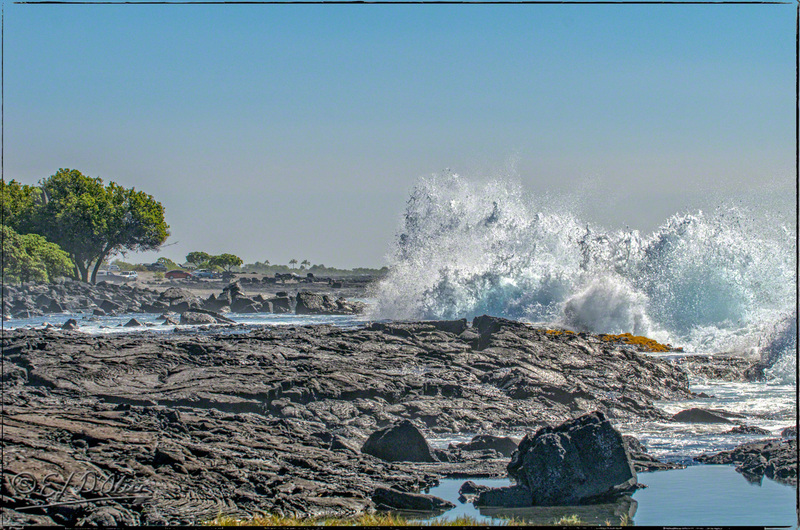 The day was January 14th and the place is Wawaloli Beach Park. Melisa and I call it “the Energy Lab” because that’s the exit you take to get there. 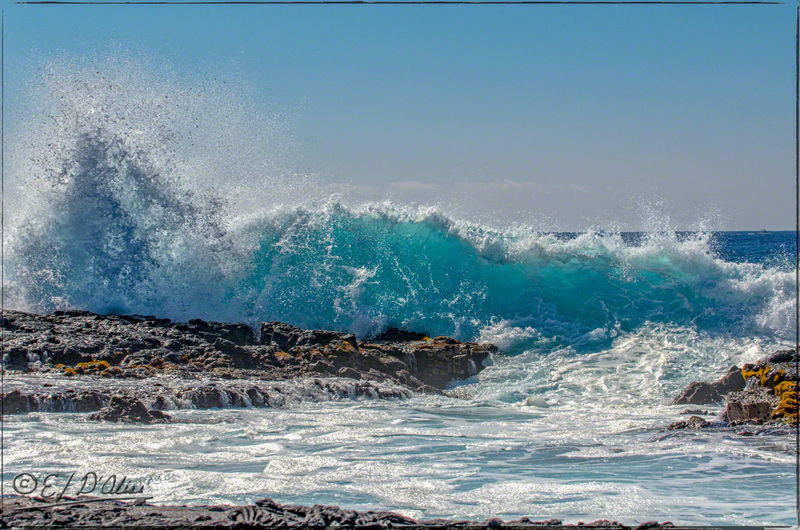 On this particular day, the surf was up, so I loaded up with the D7000 with the 70-200mm f/2.8 lens, the Nikon P900 mounted on a sturdy tripod with a video head for ease of panning, and my Samsung Note 8. I took photos and videos, some at regular speed and some in slow-motion. For two sets of photos, I combined them into animations. Please note: I suggest starting the videos below with the volume set on low. Waves and wind are pretty loud. I guess what I’m trying to say is . . . I gots me a lot of stuff to share. That means at least one more post after this one. Maybe, two. The photos I used for the animations will all be in the gallery at the end. You can also go to SmugMug and see the photos in THIS gallery. 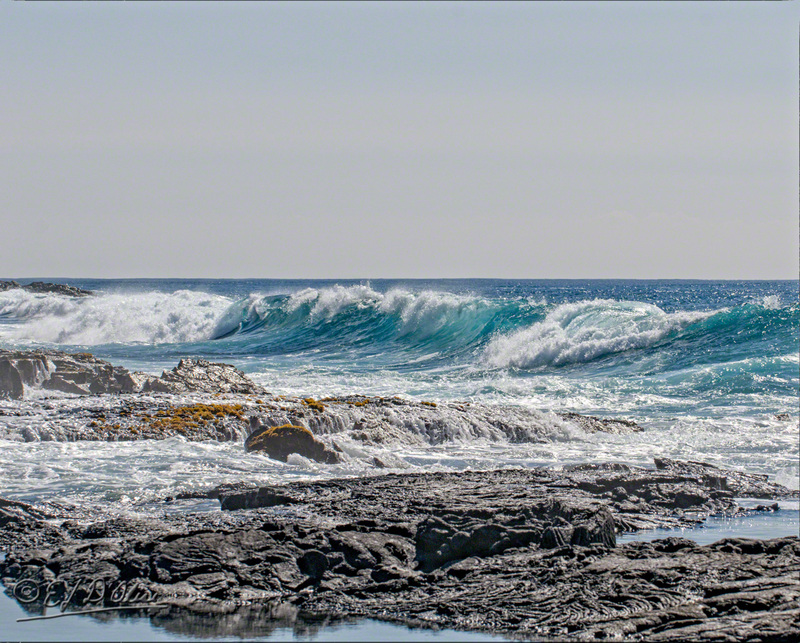 That gallery has the photos of the previous waves post and will eventually contain all the photos from these posts. I might as well get the second animation out of the way as those are the least interesting of the offerings. The only reason I even made the animations is to keep in practice. I used to do more animations when I didn’t have a convenient way to shoot videos, but that’s not the case any longer. I’m now swimming in videos. Edited to Add: I meant to put the other animation here. It’s actually shared down below. I begin with the videos shot with the Note 8. By the way, I uploaded all the videos to YouTube because they are easier to share, but I’m getting a tad annoyed with Google forever tweaking stuff, so I’m looking for another platform I can use to share videos. Probably, it will be Vimeo, although I’m still playing with that. Most of the Note 8 videos I’m sharing are around a minute long, and a few are two minutes. Personally, while you can watch them here, if you can, I suggest watching them on a larger screen and on YouTube (click on the logo) and while you’re at it, make sure they are at the higher resolution. Hint: when you’re capturing the photo with the D7000, it’s very difficult to also get the video with the Note 8. On the other hand, while you’re capturing a video with your P900, the Note 8 lets you quickly react to a changing situation and shoot this sequence. I don’t mean to nag, but please realize that the default for watching videos here is at the lower resolution. At the very least — if you won’t go to YouTube on a bigger screen — at least click the spoked wheel and change the resolution to a higher number. Now, here’s the thing . . . I have some very nice videos (both at regular speed and in slow motion) that run a little longer (3 to 6 minutes) and what I will do is post them on their own post just for those people who will take the time to watch them. The majority of readers don’t seem to have the required attention span to enjoy them (few will even watch the whole of these one and two-minutes videos) and I don’t want to bore them. For instance, this next video is only 40 seconds long . . . The noise you hear is me clicking away with the D7000. Some of the stills are used to make the animations you saw above but are also worthwhile on their own. These next shots are from the first animation. Please note that the animations were not processed (adjusted and made pretty) whereas I subsequently processed the individual shots. Some might say “overprocessed” but in this case, I wanted to show as much detail as possible. Click on the photos for a larger version, but remember that you can also go see the full-size versions in SmugMug. Here it comes again; more advice . . . these are actually pretty big files and the dimension of the image is more than twice what you see here. If you click on it and if you have a large enough screen, you will get much better resolution. Try it on the first one as well. As it is, the above doesn’t look like much . . . but the photos are pretty nice. Or, at least, I think so . . . 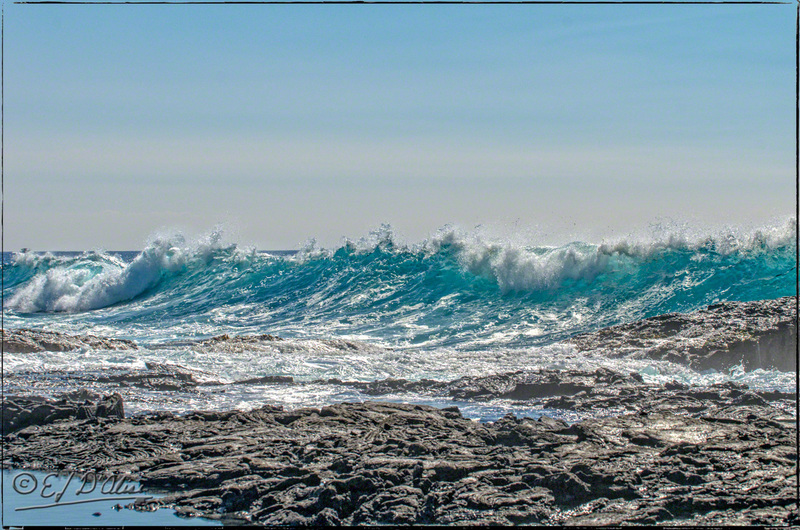 Waves are pretty exciting, at least to me. There are some blokes who get bored to death by them and I sincerely hope they won’t watch this next video because I don’t want their demise on my conscience. This video is almost two minutes long and I should have limited the slow motion to shorter spans. I will admit it’s not amazing, but some might enjoy it. If bored by it, just move on. That video for sure needs a larger screen. If you are watching that one on your phone or small tablet, you’re not going to get much from it. Not like you might from this one . . . 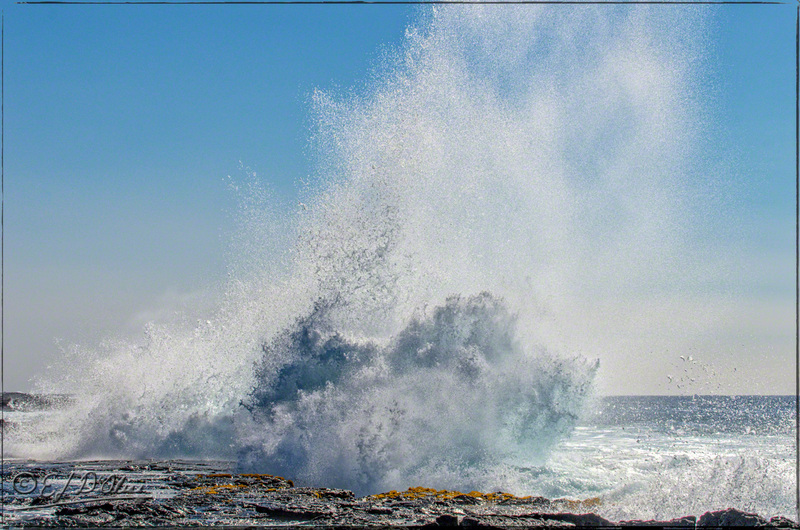 The close-up, the noise, the power of the surf . . . all in a mere 16 seconds. This next one is another Note 8 video that clocks in at 1:34 minutes, but I mind this less. Still, the wide-angle shots are not as engaging as the close-up stuff. I’m primarily a photographer, you see. I like shooting videos, but I don’t really know what I’m doing. If I capture something I like, it’s usually purely by accident. Photos, on the other hand, I can control a bit better. However, I can get closer to the action and then the Note 8 offers up decent stuff. Like, for instance, this video. I have a propensity to drop the left side of whatever camera I’m using so that the horizon is tilted. I’m aware of this and while I’m shooting I’m conscious of the fact and try to keep everything level . . . and seldom succeed. Even with the camera on a tripod and the tripod sporting a level, I end up with a slight lean. In this case, it’s also because the sunlight makes it very difficult to see the screen, and I can’t tell if I’m exactly level or not. Plus, unless I’m exactly level, the panning of the camera will amplify the tilt. 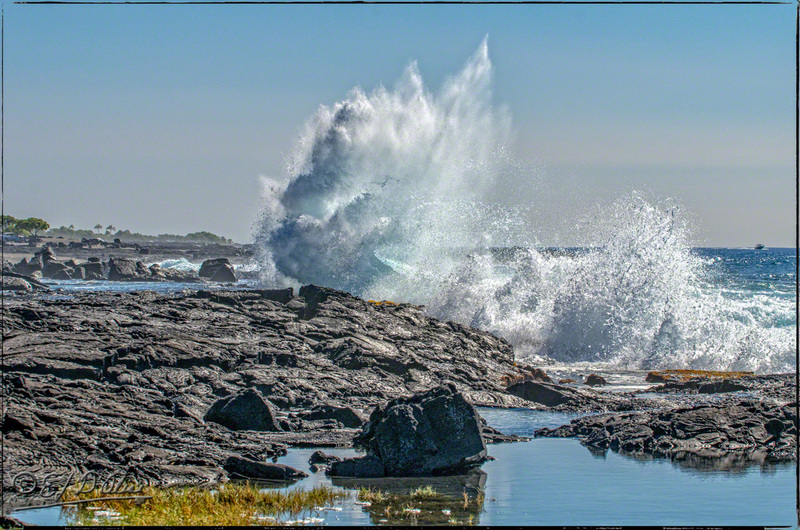 I do like catching those big splashes with the still photos and I had plenty of opportunities. But, on that day I was there for the videos. Now, you might think I only used the Note 8 for slow-motion captures. Not so. Wait, before I continue, I should mention something for people who might not be aware of it. If you hit the spoked wheel next to the logo, not only can you control the quality of the video replay, but the speed. You can actually speed up or slow down the video playback to your liking. Why, then, do I shoot in slow-motion? Well, YouTube interpolates the footage when they “slow it down” whereas when captured in slow-motion, the data is all there. It should replay smoother and without glitches. Provided, of course, you have a decent Internet connection. Note that the P900 doesn’t capture sound in slow motion (yes, it’s annoying) and so I add a music track. 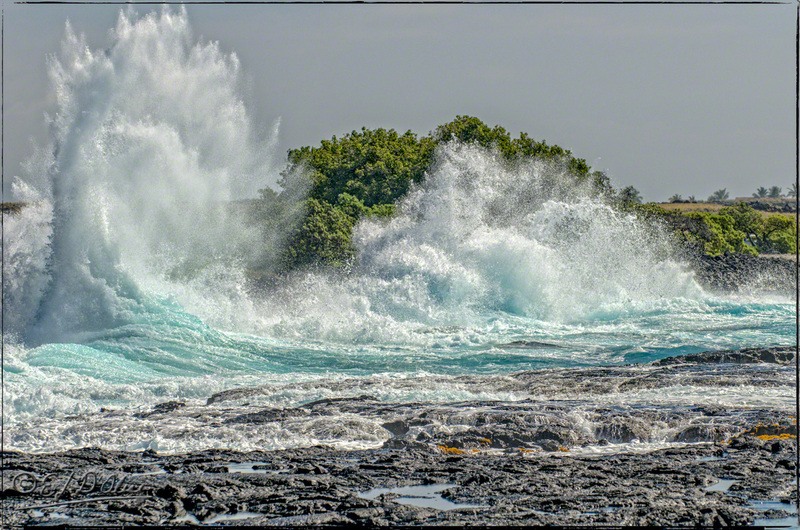 As mentioned before, I prefer what I call “epic music” for these videos of waves crashing. If I wanted to add yet another hobby to my list, I would compose my own and thus hit the proper and timed beats with the waves crashing. Heck, if I wanted to spend some time learning a couple of audio editing programs, I could do the same thing with available music. As it is, I slap these tracks in there and hope for the best. Sometimes they work, sometimes not. The next video in the series is shot at a slightly wider angle and is 6 minutes long . . . so I’ll leave it for the next post. For that one, I used a gentler, even soothing, music track. But, for this next one, I was having trouble matching available music to the visuals. So, I resorted to pulling the audio from another video and substituting it in this next slow-motion offering. I think it worked well. One other problem with the P900 slow-motion shooting is that the camera does not change the exposure for changing brightness. Too bad, that. 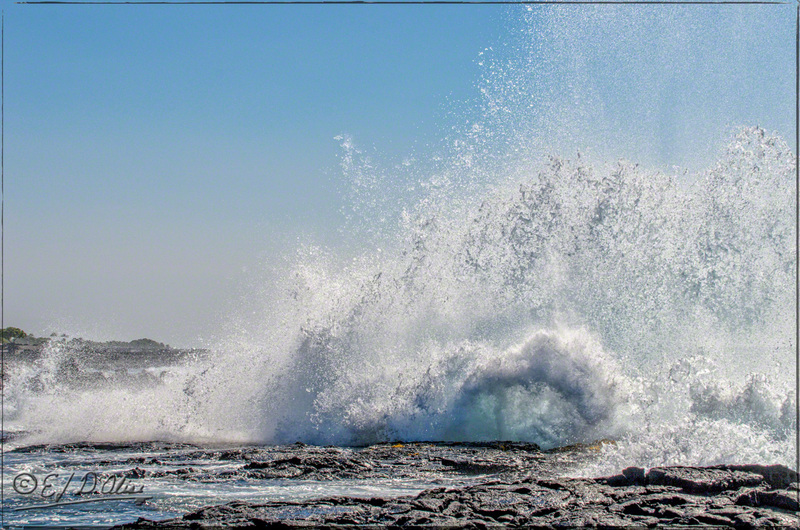 I have a number of slow-motion videos that are useless because I started shooting aimed at the lava and then panned to the breaking and exploding and very bright waves and I get pretty much the equivalent of a white screen as the video is blown. Had I known, I would have set the exposure manually (something I should do anyway but didn’t think of doing at the time). However, even setting the exposure manually doesn’t work that well when the dynamic range changes so rapidly. I hope that the next version of the camera will have more “prosumer” features. It sounds like I’m complaining but I’m actually making excuses for the differing “looks” of the videos. The exposures were all over the place and two similar videos shot seconds apart can look substantially different. Anyway, this is not a long post (time wise) so I’ll do one more video and leave the rest for the next post. Let me remind you one more time that if the video looks like it’s of poor quality, you’re likely watching at a lower resolution than it was shot. The little spoked-wheel is your friend both for quality options and if you want to slow down some of the regular speed videos so that you can see what’s going on. Be aware that playing the video at 0.5 speed will mess up the audio, so if you change the speed, you might want to mute the audio. 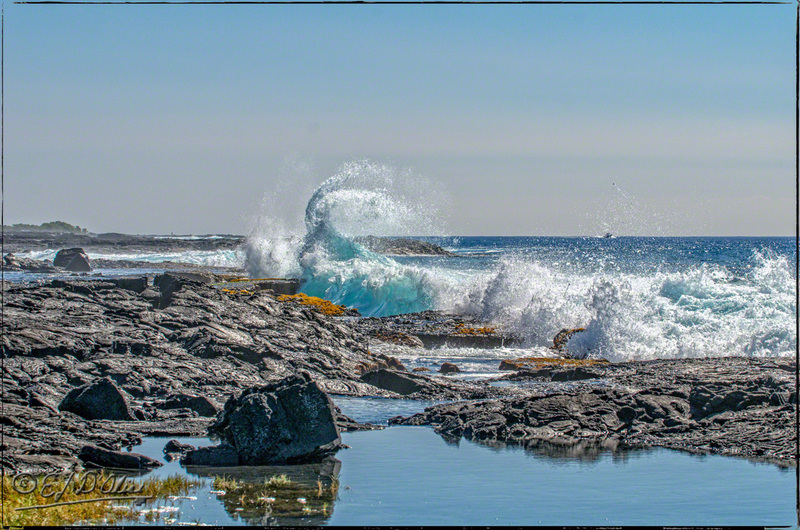 This entry was posted in Hawaii, My YouTube, Photography Stuff, Samsung Note 8, YouTube Stuff and tagged Big Island - Hawaii, Nikon P900, Samsung Note 8, slow-motion, Waves, Wawaloli Beach Park. Bookmark the permalink. I like the 10th picture, it looks like a horned beast charging out of the surf! Did you get the tsunami after the Alaska earthquake? We had a warning immediately after but it was canceled. Unlike the nuclear warning, this was less because of human error and more because it appeared to be a lateral shift of the plates and not a vertical displacement. The latter would get a volume of water traveling at a goodly pace. The former — apparently — not so much. 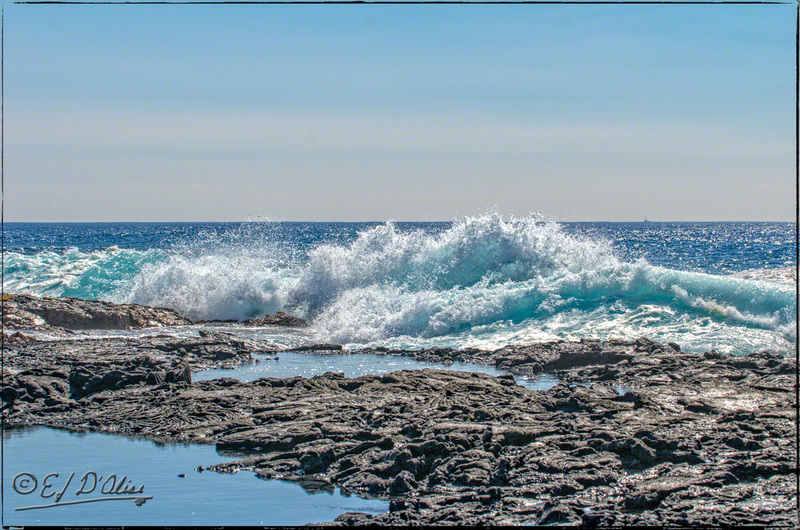 I can sit for hours, just watching waves crashing on the shore or on the rocks. But I do have to admit that some of those still pictures are really phenomenal! Thank you, Sandra. As for watching the waves, a couple of longer videos will go up in the next post (soon). One at regular speed, and one in slow motion (they are something like 6 minutes each, and while not hours, you can always loop them for longer viewings). You mean, you don’t like my book reviews, movie reviews, opinions about the human condition and my general disappointment with most humans and their endeavors, opinions about world affairs and related posts about the inevitable demise of humans as viable species, and what I post about flowers and animals and birds? Well, I guess I’ll take what I can. Thank you, and more waves videos coming up soon. Your videos looked great when I viewed them on my 27″ LG monitor on YouTube at full-screen! I especially liked that 40-second video, probably because there was no panning (a stationary desktop view is more relaxing than when the camera is moving). That’s the one where you can hear your camera clicking. I also liked the music on some of the P900 videos. Some of the Samsung videos were marred somewhat because your camera shows up in the foreground! PS — I have decided to postpone reading your book reviews until I read those books. Thank you. I have an excuse for the camera showing up in the foreground . . . I really can’t see what’s on the screen very well both because it’s very bright and because I’m wearing sunglasses and because unless I use my readers I don’t see well up close. As for the books, unless you make an effort, you’re not likely to read them. They are not exactly mainstream. I read them because they are like something I might do (self-publish) and I want to see the quality and styles of what’s out there. The good thing is that they are mostly free (and that might tell you something about the quality). 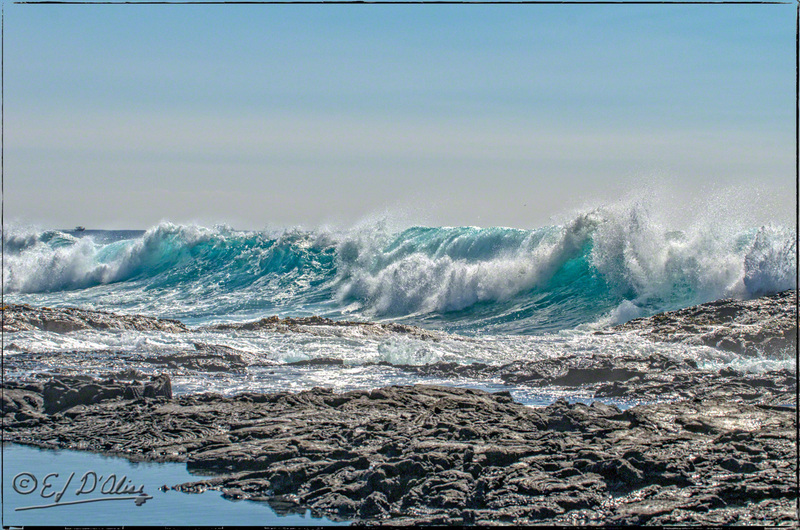 I look at the photos and watch the videos and am truly amazed that anything can survive the intensity of those waves. I now understand why the spiny sea urchin evolved into the helmet sea urchin lol! 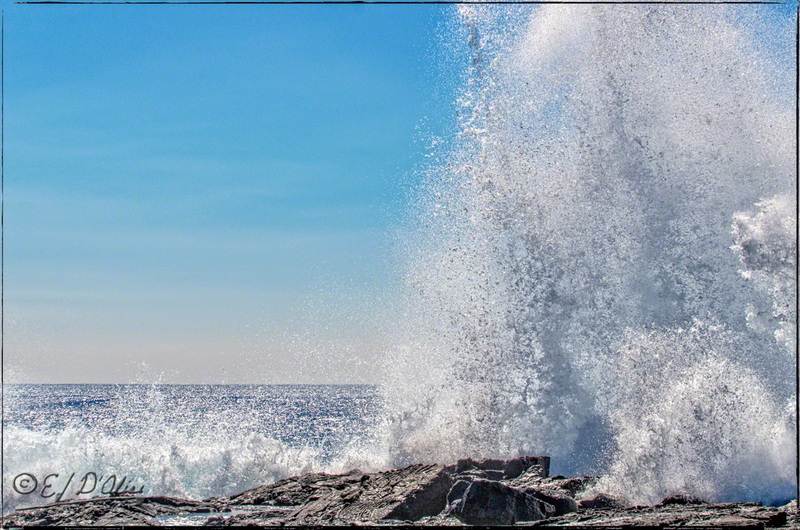 What’s mostly missing from those videos is the deep impact of the waves in the form of booms. We are four miles from the ocean and 400 feet higher in elevation but some nights — when the surf is high — I can hear the sound of waves crashing down below as a deep rumble. It’s one type of noise when they wash ashore on a sloping beach, and another when they slam onto vertical surfaces. 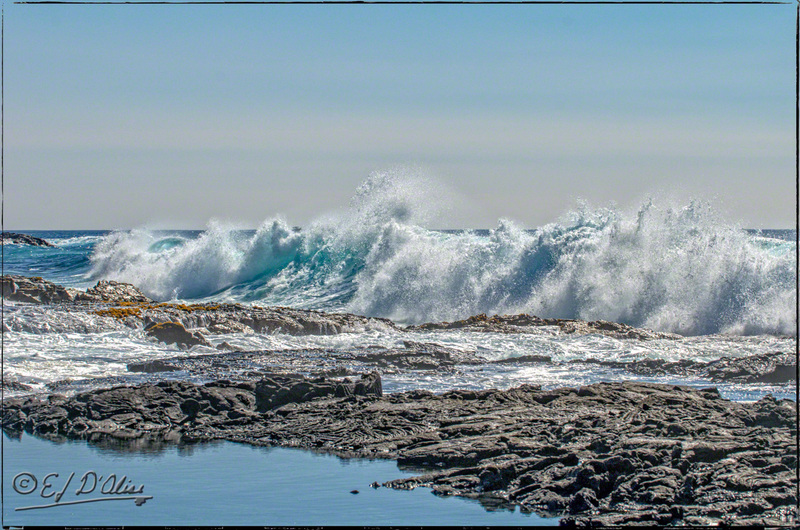 people forget that water weighs and, yes, when you see the wave rise and all that volume of water rushing ashore . . . it’s impressive. I am especially glad to hear you survived viewing the videos. You had intimated they bored you to death and fretted over whether I should post them or not. Thank you. Unfortunately, these last 12 months or so we’ve seen few such occasions. I’m hoping for a few more through the next few months of winter (such as it is). I really REALLY enjoyed this post! And seeing these particular photos together in the gallery…was very cool! 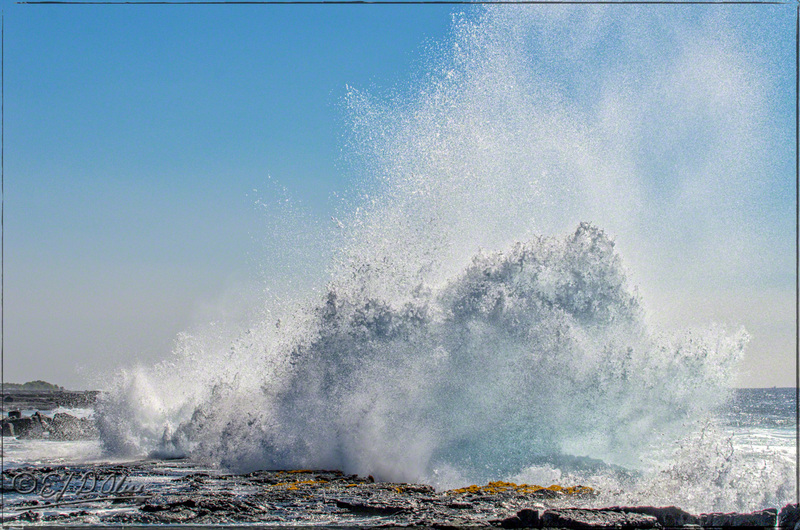 Do you ever get sprinkled or sprayed by the waves or do your lens keep you far enough back to avoid it?!?! The nano-coated filters are optically clear and they clean easy. If I got salt spray on the lens proper, I’d have to be a lot more careful in cleaning it. That said, I don’t set up where I would get large doses of salt spray. The cameras I have are not weatherproof and they would be a pain to clean and get all the salt off of them. Thanks for the links…that’s interesting. Even me, who is NOT a photographer…I was thinking about how to keep lens clean and dry. That first shot is completely stunning, partly because it has one wondering about the relationship between the breakers and the wooded hillside — one wonders if they are engulfing it, or are they sideways-on to provide the hill as a backdrop. Even without this speculation it is a striking juxtaposition. That big tree is perhaps 30 yards (~30 meters) from where the big splashes. You could certainly get wet there if the wind is blowing the right way. 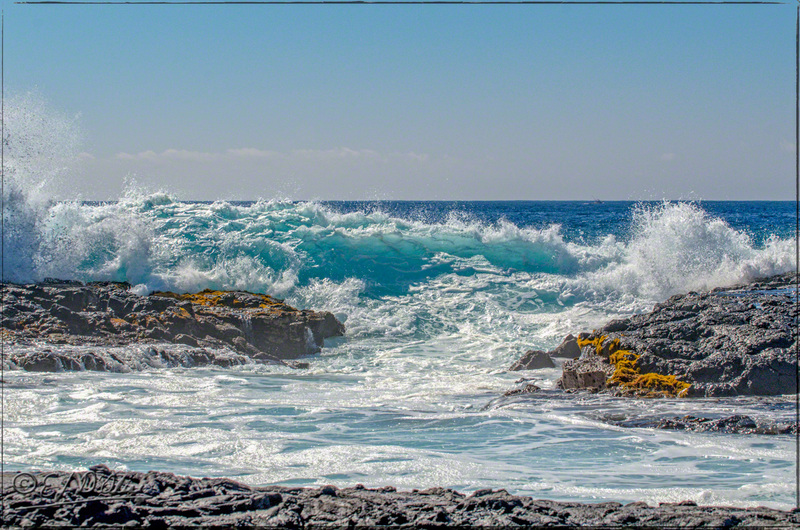 Some of the latter videos show the relationship of the rocks and the big splashing waves (especially in the next post). I did start getting the hang of the layout, but probably need to run through a couple of times more. Anyway, part of the impact on first viewing is the uncertainty regarding perspective.